Hill Climb Racing is one of the most addictive and entertaining physics based driving games ever made! 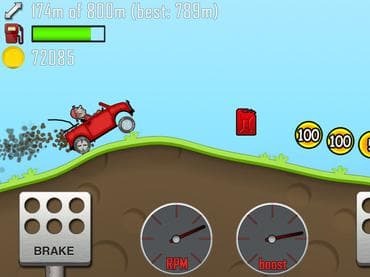 Hill Climb Racing is one of the most addictive and entertaining physics based driving games ever made! Face the challenges of unique hill climbing environments with many different cars. Gain bonuses from daring tricks and collect coins to upgrade your car and reach even higher distances. Watch out though - Bill's stout neck is not what it used to be when he was a kid! And his good old gasoline crematorium will easily run out of fuel. Lots of different vehicles with unique upgrades (many different vehicles: bike, truck, jeep, tank, etc.) Numerous stages with levels to reach in each; Countryside, Desert, Arctic and even the Moon! Если у Вас есть вопросы, связанные с игрой Hill Climb Racing пожалуйста используйте эту форму для связи с нами.